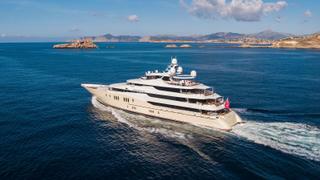 The mighty 78.43 metre motor yacht Eminence has been listed for sale by Burgess. Built in steel and aluminium by German yard Abeking & Rasmussen to a design by Reymond Langton, Eminence was delivered in 2008 and has since been used only privately. Lloyds classed, her vast interior, again by Reymond Langton, has very versatile accommodation for up to 16 guests in eight cabins comprising a master suite with a private terrace, two VIP suites, three doubles and a twin, plus a further double guest/crew cabin. All cabins have en suite bathroom facilities while the crew quarters sleep up to 24 staff aboard this yacht for sale. The main saloon lounge area boasts large and comfortable cushioned sofas and elegant coffee tables. There is also a large cinema where guests may relax on a semi-circular sofa. Special features include a fully enclosed elevator connecting her four lower decks and a fully equipped gym, massage room and sauna. A further outstanding area is her bridge deck dining room, which features a horseshoe table surrounded by sliding glass doors that can open the space entirely and deliver panoramic views when closed. Twin Caterpillar 3516 diesel engines give her a top speed of 16 knots, a cruising speed of 14 knots and a transatlantic range of 6,350 nautical miles at 11.6 knots. Lying in the South of France, Eminence is asking €80,000,000.